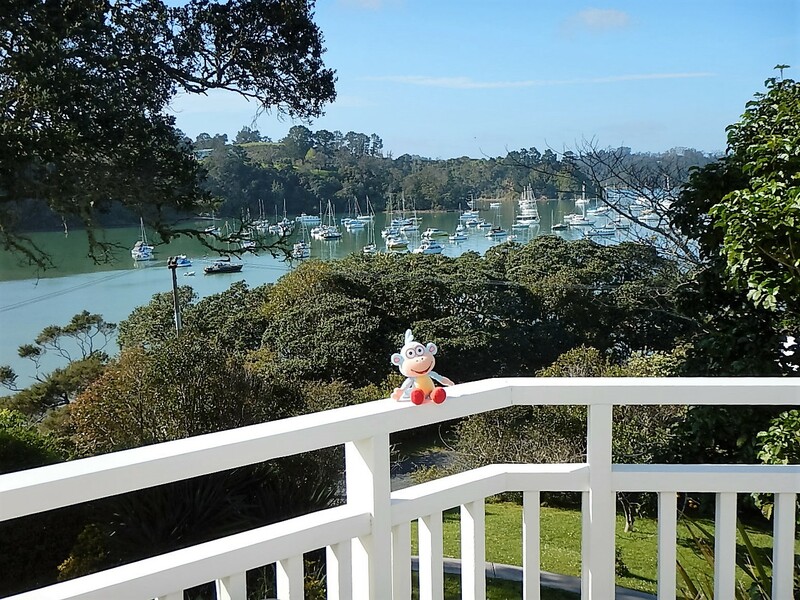 Our first stop on our NZ road trip was Russell in the Bay of Islands, 250km north of Auckland. The drive up was really easy, we took the motorway part of the way then peeled off on the east coast road which wound through the hills and along the coast passing little bays and inlets. It was cloudy when we left and we had some heavy rain on the motorway but it cleared through and by the time we reached Russell it was blustery but mainly dry. Russell is a genteel seaside village with a colourful history. Captain Cook moored in the bay on his first (of three) visit to NZ, Russell was New Zealand’s first capital and still has the oldest church in the country. At one time Russell was known as the Hell Hole of the Pacific having become a stopping off point for European and American fishermen and whalers, it was a lawless place with no police force and lots of pubs and brothels. Both the Anglican and the Catholic churches set up missions in the area and the local Maoris became so offended by behaviour and its impact on trade that they wrote to King William and asked him to sort it out! There were a number of attacks by a local Maori tribe which eventually forced the evacuation of the town, you can still see musket shell holes in the walls of the church. We arrived in Russel in the early afternoon so we had a look around and went to visit the museum which was very good; it covered the Maori culture and heritage, the early settlement and more recent history. We also stopped in to one of the restaurants on the seafront and had a bowl of seafood chowder each. After that we went to find our B&B and checked in. 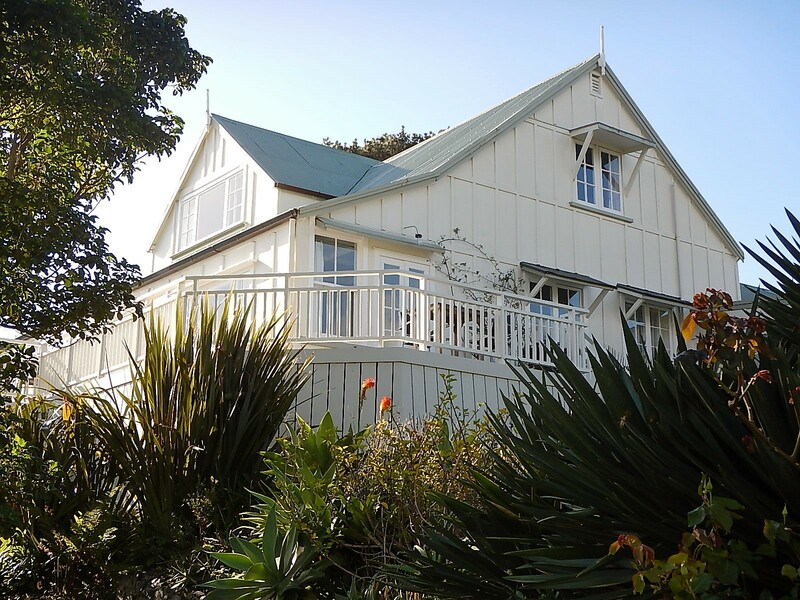 The Arcadia Lodge was lovely, a Victorian villa overlooking an inlet just over the hill from Russell. We were greeted by David, one of the owners, who served us tea in the guest lounge and showed us to our room which was really cosy and had a pretty little sun room adjoining it, with access to our own balcony and a fantastic view which reminded us of the Fal estuary in Cornwall. We had a good night’s sleep and were treated to an excellent breakfast with homemade muesli, marmalade and jam, and fresh fruit from the garden (poached plums, mandarins, kiwi fruit and grapefruit). David and his partner Brad also served up delicious breakfast quiche with bacon, egg and roasted tomato. The weather on Friday didn’t look very promising so we decided to stay in Russell and explore, it was the right decision, we had some squally showers in the morning and around lunch time the wind really picked up, it was so rough that a Princess Cruise ship bound for Auckland took shelter in the bay for the day after two very rough days at sea. IN the morning we visited the church and walked to the site of the original Catholic mission known as Pompallier. Most of the mission buildings have been destroyed but there is still a solid two storey building which housed a printing press, a tannery and a book-binding room. We got there in time for the 11am guided tour which was really interesting and very entertaining. We learnt about the work the missionaries did to build the building (the first factory in NZ), the printing they did, publishing bibles, prayer books and catholic instructional books some of them published in Maori. Over a period of 8 years they published 40,000 books. We also learned about the tanning process and how some of the leather was used to bind the books. After that we headed to The Duke of Marlborough Hotel by the pier for a lunch of delicious calamari and chips washed down by a tasting sampler of New Zealand wines. While we ate we watched the local passenger ferry battling across the bay and attempting to moor alongside a pontoon that was rocking wildly. We also saw one of the marker buoys from the harbour break loose, wash ashore, and be rescued by three men in a truck with a crane on the back to lift it. The Duke of Marlborough was an interesting place, it opened in 1827 as Johnny Johnston’s Grog Shop, it was at the centre of the riotous behaviour during Russell’s time as the Hell Hole of the Pacific and the bar staff where t-shirts saying ‘serving rouges and ruffians since 1827’. The owner renamed it after the Duke of Marlborough because he thought that sounded classy, and eventually it became the first licenced premises in NZ. On Saturday the weather was much improved so we took the car across the inlet on the car ferry to Pahia and drove a few km out of town to visit the Waitangi Treaty Grounds, the site of the treaty signing between the British Crown and the Maoris which established NZ as part of the British Empire (1840). The treaty grounds are on a headland overlooking the Bay of Islands, it is a beautiful spot and a great deal of effort has gone in to telling the story from the first arrival of the Europeans, through the signing of the treaty and right up to date explaining the continuing efforts to interpret and fairly apply the terms of the treaty to ensure Maori rights. We had a one-hour guided tour from a Maori guide who was excellent. After three hours at Waitangi we drove on to Kerikeri Inlet, another historic site featuring the oldest stone building in NZ (a store house/post office/general store) and the oldest European homestead. Back to Russell in time for tea on the balcony with some fellow guests, and then we walked in to the village for dinner. We ordered a rib of beef to share and while we were waiting for it to be served a pod of dolphins appeared at the end of the pier and entertained us for a few minutes. We had a wonderful meal as the sun sank over the harbour then we walked back to Arcadia Lodge for our last night there. 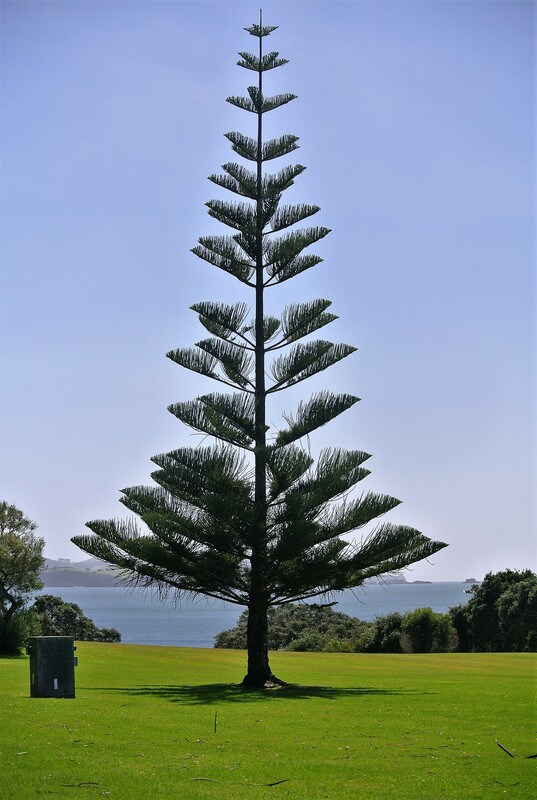 Sunday morning, we set of back towards Auckland en-route to the Coromandel Peninsula, we broke the journey with an overnight stop in the Victorian seaside town of Devonport which faces across the harbour to downtown Auckland. We had a nice drive down but the weather started to close in as we arrived so we had a look around then found a table in the Esplanade Hotel for a late lunch – to Marks pleasure they were doing a traditional Sunday roast, lamb with gravy, mint sauce and lots of vegetables followed up by apple crumble and custard – they must have known he was coming! We spent the night in another historic Victorian building on the seafront, the Peace and Plenty Inn where we were made very welcome by the owner, Judy, an English expat who hasn’t forgotten how to serve proper English bacon and eggs.